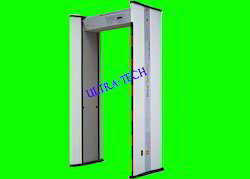 ULTRA-TECH SECURITY SOLUTIONS IS THE LEADING SUPPLIERS, SERVICE PROVIDER & DEALERS FOR DOOR FRAME / WALK THROUGH METAL DETECTORS OF LEADING MANUFACTURER OF METAL DETECTORS. THIS PRODUCT IS USED FOR SECURITY & PILFERAGE PREVENTION APPLICATION INCLUDING AIRPORTS, PRISONS, CUSTOMS, BANKS, POLICE DEPARTMENT, COURT ROOMS, PUBLIC BUILDING, INDUSTRY ETC. 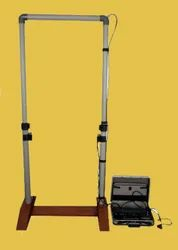 PORTABLE DOOR FRAME METAL DETECTOR.MODEL : ULTRA - SM-2512 MICRO CONTROLLER BASED. 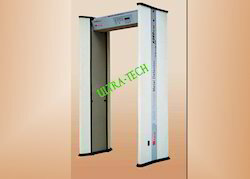 ULTRA-TECH SECURITY SOLUTIONS is the Leading Suppliers, Service Provider & Dealers for Portable Door Frame / Walk Through Metal Detectors of Leading Manufacturer of Metal Detectors. This Product is used for Security & Pilferage Prevention Application Including Airports, Prisons, Customs, Banks, Police Department, Courtrooms, Public Building, industry etc. 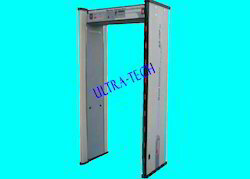 This ULTRA - SM-2512 (MICRO CONTROLLER BASED) Portable Door Frame / Walk Through Metal Detectors Owing to perfection and quality oriented approach, we have carved niche in the industry by offering an enormous grade array of Portable Door Frame Metal Detector. Our given metal detector is used in the jewelry manufacturing units and other various manufacturing units to protect the various unavoidable pilfering activities. 2. Control Unit : Micro Controller Based Control Unit With Advance Features. Variable Pitch Audio Through Micro Controller With Mute Facility. 7.Optical Sensor : Will Facilitate Detection Of Metal Only When A Person Passes Through Sensitivity Zone.Avoid Detection Of Metal Movement Outside Detection Zone Using Single Sided Sensor & Single Connector For Sensor As Well As Coil. 8. Counters : Counting Of Number Of Persons Passing The Sensing Zone & Number Of Detection For References & Analysis By Supervisor. Wooden Base : 400 x 125 x 80 mm App. Weight : 9500 gm App. 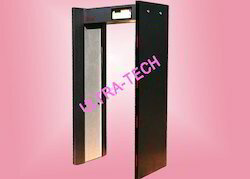 We Are The Leading Manufacturer And Suppliers For Door Frame Metal Detector In South India Such As Thiruvallur, Chennai, Kancheepuram, Vellore, Thiruvannamalai, Krishnagiri, Dharamapuri, Villipuram, Cuddalore, Salem, Erode, Namakal, Perambalur, Nilgiris, Coimbatore, Tiruppur, Karur, Tiruchchirapalli, Ariyalur, Nagapattinam, Thanjavur, Thiruvarur, Nagapattinam, Pudukkotai, Dindigul, Theni, Madurai, Sivagangai, Ramanathapuram, Virudunagar, Tirunelveli, Thoothukudi, Kanniyakumari, Hosur, Rajapalayam, Puduchcheri, Kerala. 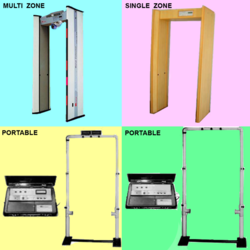 This ULTRA - RE-PMD-2VS Portable Door Frame / Walk Through Metal Detectors Owing to perfection and quality oriented approach, we have carved niche in the industry by offering an enormous grade array of Portable Door Frame Metal Detector. Our given metal detector is used in the jewelry manufacturing units and other various manufacturing units to protect the various unavoidable pilfering activities. 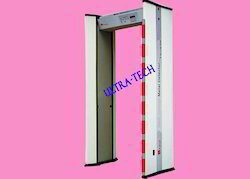 ULTRA-TECH SECURITY SOLUTIONS is the Leading Suppliers, Service Provider & Dealers for Door Frame / Walk Through Metal Detectors of Leading Manufacturer of Metal Detectors. This Product is used for Security & Pilferage Prevention Application Including Airports, Prisons, Customs, Banks, Police Department, Courtrooms, Public Building, industry etc. This ULTRA – RE - ROBO III is Single Zone Separate Metal Detectors in One Frame. The Search Coil & Control Modules Are Housed In Aesthetically Designed Archway. The Archway Designed For Quick Installation & Erection. Walk / Stop Indicator Is Incorporated Above The Entrance Of The Archway To Regulate The Flow Of Traffic. All The Controls & Audio Visual Indication Are Provided On The Top Of The Rear Side Of The Archway. All Electronic Circuits Are Designed With Plug - In Card System For Easier Service ability. Weight : Approx. 45 Kg. 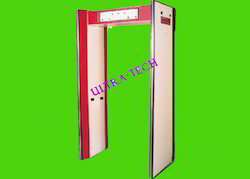 ULTRA-TECH SECURITY SOLUTIONS is the Leading Suppliers, Service Provider & Dealers for Door Frame/ Walk Through Metal Detectors of Leading Manufacturer of Metal Detectors. This Product is used for Security & Pilferage Prevention Application Including Airports, Prisons, Customs, Banks, Police Department, Courtrooms, Public Building, industry etc. 2. Optimum Level 4-6: For Higher Security Prone Area.Small Size Of Arms & Ammunitions, LED's Etc..
Used In : Defence Services , Police Establishments , Factory Watch & Ward & Security Services. Sensitivity of each zone can be set separately to get uniform sensitivity at each zone Microprocessor technology ensures fast & reliable data processing & operation. Metal detection,Sensitivity setting, Threshold setting, Zone discrimination. 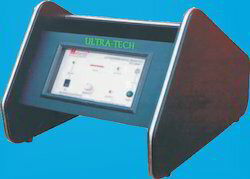 ULTRA - RE-MP-III Detects both ferrous & Non-ferrous Metal. 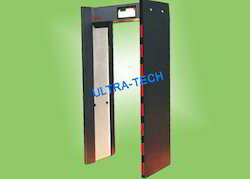 2.This ULTRA - RE-MP-III Multi Zone Door Frame Metal Detector is made of Heavy Sunmica Body. 10. Infra red occupancy sensors. 11. Digitally controlled sensitivity, & volume. 12. Independent sensitivity setting of each zone. 14. Battery backup for memory protection ( Optional). 2. Passage Clearance: 515 x 760 x 1865 mm. 3. Overall frame assembly: 515 x 895 x 2130 mm. Sensitivity of each zone can be set separately to get uniform sensitivity at each zone Microprocessor technology ensures fast & reliable data processing & operation. Metal detection,Sensitivity setting, Threshold setting, Zone discrimination. ULTRA - RE-MP-III + Detects both ferrous & Non-ferrous Metal. 2.This ULTRA - RE-MP-III + Multi Zone Door Frame Metal Detector is made of High Quality PVC / ABS Body. This ULTRA - RE-MP-IV is Four Zone Separate Metal Detectors in One Frame. This Coil Structure enable the Metal Detection Process Compared to Conventional Single Zone metal Detector. Metal location is reliably displayed at each zone. If metal present in more than one zone, all zones with metal are displayed on the geographical Zone Representation provided on the front Panel and the zone with the peak metal are displayed on the 8 digit LED display. Sensitivity of each zone can be set separately to get uniform sensitivity at each zone Microprocessor technology ensures fast & reliable data processing & operation. Metal detection,Sensitivity setting, Threshold setting, Zone discrimination. ULTRA - RE-MP- IV Detects both ferrous & Non-ferrous Metal. 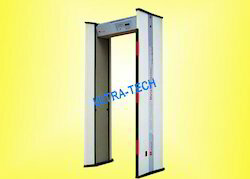 2.This ULTRA - RE-MP-IV Multi Zone Door Frame Metal Detector is made of Heavy Sunmica Body. Sensitivity of each zone can be set separately to get uniform sensitivity at each zone Microprocessor technology ensures fast & reliable data processing & operation. Metal detection,Sensitivity setting, Threshold setting, Zone discrimination. ULTRA - RE-MP- IV + Detects both ferrous & Non-ferrous Metal. 11. Infra red occupancy sensors. 12. Digitally controlled sensitivity, & volume. 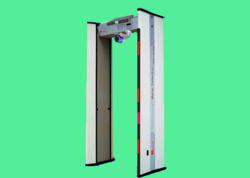 Multi Zone Door Frame Metal Detector, Model : ULTRA - RE-MP-IV + With Camera. Sensitivity of each zone can be set separately to get uniform sensitivity at each zone Microprocessor technology ensures fast & reliable data processing & operation. Metal detection,Sensitivity setting, Threshold setting, Zone discrimination. Thus ULTRA - RE-MP- IV + with Camera can Face Detects both from Entry to Exit Points & Also can Detects both ferrous & Non-ferrous Metals. 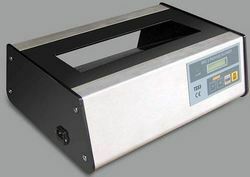 Ø Detector is made of High Quality PVC/ABS Body. 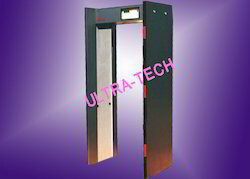 ULTRA-TECH SECURITY SOLUTIONS is the Leading Suppliers, Service Provider & Dealers for Door Frame / Walk Through Metal Detectors of Leading Manufacturer of Metal Detectors. This Product is used for for Security & Pilferage Prevention Application Including Airports, Prisons, Customs, Banks, Police Department, Courtrooms, Public Building, industry etc. This ULTRA - RE-MP-VI is Six Zone Separate Metal Detectors in One Frame. This Coil Structure enable the Metal Detection Process Compared to Conventional Single Zone metal Detector. Metal location is reliably displayed at each zone. If metal present in more than one zone, all zones with metal are displayed on the geographical Zone Representation provided on the front Panel and the zone with the peak metal are displayed on the 8 digit LED display. Sensitivity of each zone can be set separately to get uniform sensitivity at each zone Microprocessor technology ensures fast & reliable data processing & operation. Metal detection,Sensitivity setting, Threshold setting, Zone discrimination. ULTRA - RE-MP- VI Detects both ferrous & Non-ferrous Metal. 2. 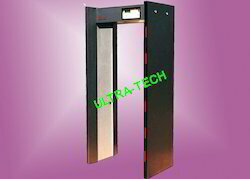 This ULTRA - RE-MP-VI Multi zone Door Frame Detector is made of Heavy Sunmica Body. 14. Battery backup for memory protection (Optional). This ULTRA - RE-MP-VI + is Six Zone Separate Metal Detectors in One Frame. This Coil Structure enable the Metal Detection Process Compared to Conventional Single Zone metal Detector. Metal location is reliably displayed at each zone. If metal present in more than one zone, all zones with metal are displayed on the geographical Zone Representation provided on the front Panel and the zone with the peak metal are displayed on the 8 digit LED display. Sensitivity of each zone can be set separately to get uniform sensitivity at each zone Microprocessor technology ensures fast & reliable data processing & operation. Metal detection, Sensitivity setting, Threshold setting, Zone discrimination. ULTRA - RE-MP- VI + Detects both ferrous & Non-ferrous Metal. 2. This ULTRA - RE-MP-VI + Multi Zone Door Frame Metal Detector is made of High quality PVC / ABS Body. 13. Safe For Cardiac Pacemakers ( Operating Frequency 10 KHz - 20 KHz ) & Film Safe. 2. Passage Clearance : 515 x 760 x 1865 mm. 3. Overall frame assembly : 515 x 895 x 2130 mm. 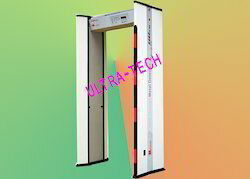 Multizone Door Frame Metal Detector. Reliance RE - MP -VIII are Eight zone separate metal detectors in one frame. This coil structure enhance the metal detection process compared to conventional single zone metal detector. Metal location is reliably displayed at each zone . If metal present in more than one zone, all zones with metal are displayed on the geographical Zone Representation provided on the front panel and the zone with the peak metal is displayed on the 8 digit LED display. Sensitivity of each zone can be set separately to get uniform sensitivity at each zone. Microprocessor technology ensure fast & reliable data processing & operation. Metal detection, sensitivity setting, Threshold setting, Zone discrimination. RE-MP-VIII detects both ferrous & nonferrous metal. 8. Infra red occupancy sensors. 9. Digitally controlled sensitivity, & volume. 10. Independent sensitivity setting of each zone. 12. Battery backup for memory protection ( Optional). This ULTRA - RE-MP-VIII + is Eight Zone Separate Metal Detectors in One Frame. This Coil Structure enable the Metal Detection Process Compared to Conventional Single Zone metal Detector. Metal location is reliably displayed at each zone. If metal present in more than one zone, all zones with metal are displayed on the geographical Zone Representation provided on the front Panel and the zone with the peak metal are displayed on the 8 digit LED display. Sensitivity of each zone can be set separately to get uniform sensitivity at each zone Microprocessor technology ensures fast & reliable data processing & operation. Metal detection,Sensitivity setting, Threshold setting, Zone discrimination. ULTRA - RE-MP- VIII + Detects both ferrous & Non-ferrous Metal. 2. This ULTRA- RE-MP-VIII + Multi Zone Door Frame Metal Detector is made of High Quality PVC/ABS Body. 10. Digitally controlled sensitivity, & volume. 11. Independent sensitivity setting of each zone. This ULTRA - RE-MP-IX + is Nine Zone Separate Metal Detectors in One Frame. This Coil Structure enable the Metal Detection Process Compared to Conventional Single Zone metal Detector. Metal location is reliably displayed at each zone. If metal present in more than one zone, all zones with metal are displayed on the geographical Zone Representation provided on the front Panel and the zone with the peak metal are displayed on the 8 digit LED display. Sensitivity of each zone can be set separately to get uniform sensitivity at each zone Microprocessor technology ensures fast & reliable data processing & operation. Metal detection,Sensitivity setting, Threshold setting, Zone discrimination. ULTRA - RE-MP- IX + Detects both ferrous & Non-ferrous Metal. 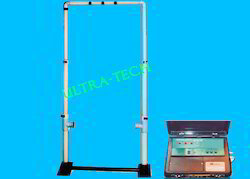 2.This ULTRA - RE-MP-IX + Multi Zone Door Frame Metal Detector is made of High Quality PVC/ABS Body. 8. HPCSS ( Optional ) Photo capture & storage. 15. Infra red occupancy sensors. By keeping track of current market development, we are offering an excellent range of Letter Bomb Detector. Our bomb detectors detect all types of integrated circuits & detonators normally used in letter bomb detector. The offered bomb detectors are demanded in the industry for its sharp beep through peizo electric buzzer. We are giving these bomb detectors on numerous specifications within a confine time. Rough & Tough For Use. Environment : 10 Degree C To 50 Degree C Conditions. Being a well established-organization, we are engaged in wholesaling, trading, distributing and supplying a distinguished range of TS -53 (Mail & Parcel Scanner). This unit will give alarm whenever it detects the metallic object. The entire range of scanner is very effective tool in detecting mini bomb in letters. Our offered scanner can be used to prevent terrorist activities and ensure the safety for the important departments and organs. Alarm: LED Light / Sound(Optional) with density Bar Graph. Looking for DOOR FRAME METAL DETECTOR ?